The idea of cyclicality is central to our logo. 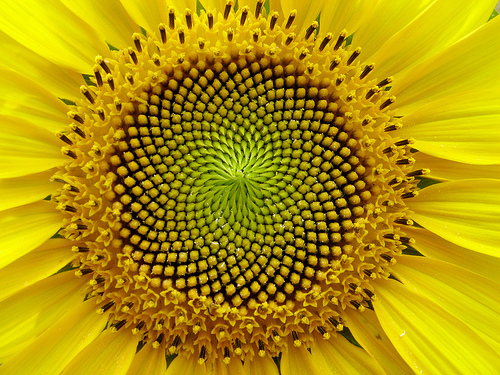 The logo represents one of the innumerable models in which the Fibonacci sequence and the golden section can be found: an order coming from the bottom, in which the collaboration of the components allows a harmonious development through a rule centrally defined, but that can be only applied locally. Every element is uniquely determined by that which precedes it, and in turn determines that which succeeds it. Every element is fundamental, and contributes in its own small way to the growth of the system to which it belongs in its entirety. In the same way, each team’s member is fundamental for the team to succeed and each team is fundamental for the community to succeed. The man, with his talent, designs and plans solutions to complex problems. Through innovation and social entrepreneurship, he tries to find answers to environmental and social issues. Nature, in its clarity and immediacy, has always used patterns and strategies proved to be valid and effective by time. For this reason, our logo found inspiration in the idea of cyclicality that can be found also in nature. Since nature itself suggests us solutions and strategies, it shows us synergetic and growth models that can be applied and repeatable, in an innovative approach, to pursuit sustainable solutions to the challenges we have to face today.